Camping can be the perfect getaway, a great way to leave behind the stresses of our daily lives. But forgetting key items can quickly turn a dream camping trip into a nightmare. Camping storage is key to mastering campsite organization and ensuring nothing important is left behind. We have done the research for you, sorting through the myriad of camping storage containers on the market, to show you the best. 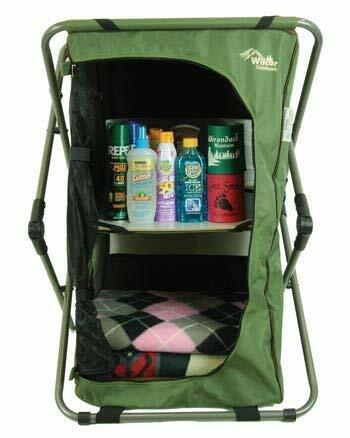 Armed with the essential camping gear storage you will be able to optimize your camping experience. All you have to worry about is enjoying the great outdoors. Pop-up cupboards are a practical choice for camping. They pack down flat and can slide easily in between other items in your car or can be put in the trunk for other items to be stacked on top of. The beauty of this type of camping storage is that it occupies vertical space, not just floor space, which is often in short supply. The polyester fabric makes for a durable product, and the steel frame ensures the cupboard is strong and can withstand those windy nights. Wilcor’s pop-up cupboard also has a mesh zippered panel on the front so you can leave your food inside without worrying about creepy crawlies getting into it. 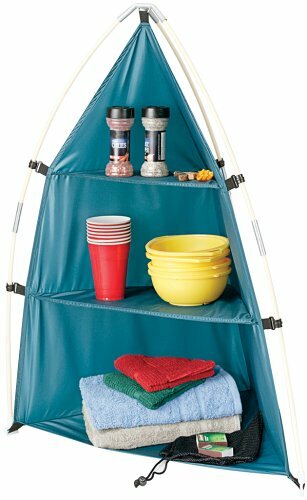 Unfolded, the camping pop-up cupboard measures; 121cm (48 inches) in height, 50cm (20 inches) wide, 48.2cm (19 inches) deep. Tents are not designed to be as spacious as our homes so it can be frustrating trying to find a camping gear storage option to fit the small space. That’s where the Coleman free standing organizer comes in. It fits neatly into the corner area of many conventional tents whilst taking up minimal space. It has 3 shelves, tapering at the top, but can surprisingly, despite its small size, provide quite a bit of camping gear storage. It measures 65cm (25 inches) in length, 45cm (17.7inches) in width, and weighs less than 700 grams (1.5 pounds) placing it among the perfect camping storage containers for your next camping trip. The ActionPacker is for the serious camper who needs to make sure their camping gear storage game is without parallel. 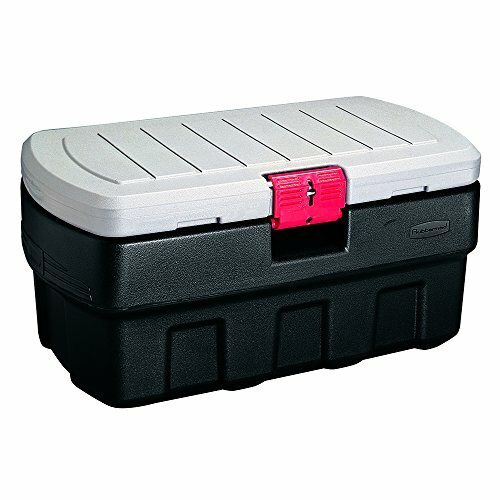 This tough box has a durable, water resistant construction and is lockable - providing extra security. Unlike other types of camping containers the ActionPacker is completely opaque, no one and no animal will be able to see what is stored inside. Inside you can pack a multitude of equipment, including; a conventional 2 man tent, sleeping bags, food, clothing and some smaller kitchen equipment all at the same time. There are 4 sizes of the ActionPacker; 8 (30lts), 24 (91 lts), 35 (132 lts) and 48 (181 lts) gallon and all provide the same robust protection making it the king camping storage box. Garbage disposal whilst camping can be an issue, so why not remove the disposable items all together? It is far easier to take a set of good quality camping containers to store food in. 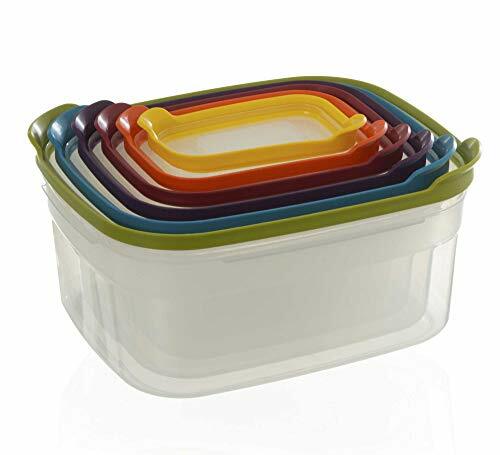 The Joseph Joseph Nest Storage is comprised of 6 containers with colorful lids. But the beauty of these camping containers is the way they all fit inside each other. When you have consumed all the containers contents each will neatly stack inside the other, like a Russian doll, taking up no more space than the largest container (4.5lts (1.1 gallons)). The 6 containers range in size from 230ml to 4.5lts, and are the perfect solution for campsite food storage. Unless you are open to sipping from streams or constructing a rainwater tank on site out of available materials, you will need to consider how to store water on your camping trip. 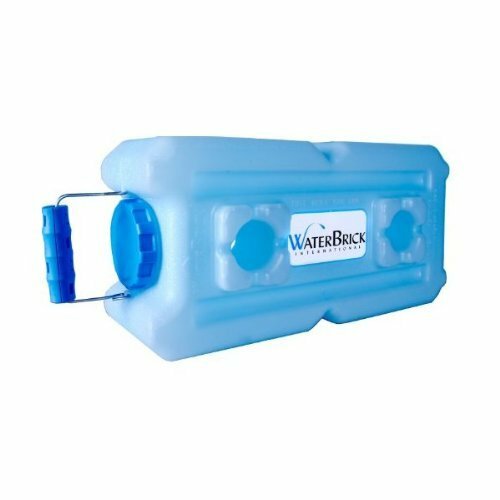 The WaterBrick can store 3.5 gallons (13lts) of water and is made from polyethylene and is BPA free, you don’t have to worry about any nasty chemicals leeching into your water. What makes this camping container unique is its stackability. It has a modular design, enabling 2, 3, or more of the same containers to be stacked on top, next to, or across each other. The strong but comfortable handles enable the WaterBrik to be carried with ease. This camping container measures in at 15cm (6 inches) in height, 45cm (18 inches) in length, and 23cm (9 inches) in width. Knowing what to pack and how to pack it can be daunting, especially when you consider the range of camping containers and storage options on the market. Remember the key to a great camping experience is organization. Make sure you have your basics covered; good tent, kitchen storage, in-tent storage, food containers, water storage, and finally, a storage container to store all your camping equipment inside. This will ensure you keep all your equipment safe and secure, and your valuables protected. Now that you have all the camping storage options you need, it’s time to get packing and enjoy your next camping trip.